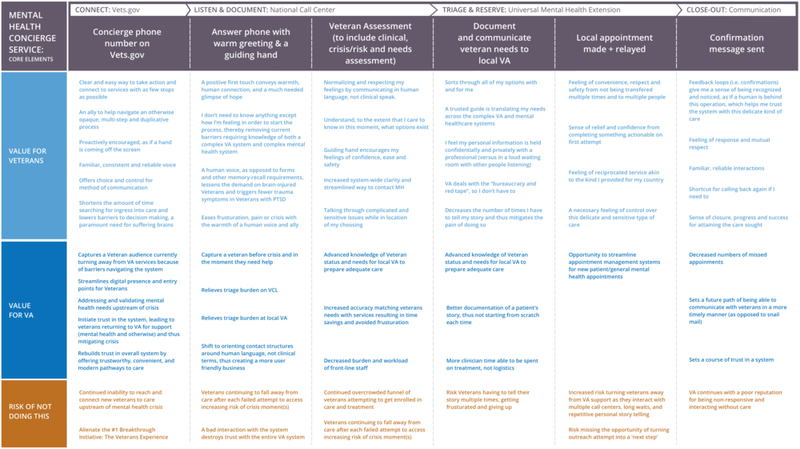 Context: Designed based on Veteran needs and insights from Veteran Access to Mental Health Services report (2015) and the Clay Hunt Act, the Mental Health Concierge is a modernized digital and phone pathway into VA mental health services, designed for those standing at the doorstep of the VA, wondering if it's a good fit for them. Designed to ensure that the one time someone reaches out, we answer. It sounds so simple, but is a near impossible task - especially for someone new to the system. In fact, because of the variance at each Medical Center (from what the offices are called to the jargon used to describe each), it's nearly impossible for someone to pick up the phone in a moment of urgency, find a phone number, and call to get an appointment. The Veterans Crisis Line is seen by those upstream of crisis as far too extreme for what they need (not to mention, they don't want to take the resources away from someone "who needs it more than I do"). The VA Concierge is a redesigned and modern day phone, web and digital pathway into mental health services at the VA.